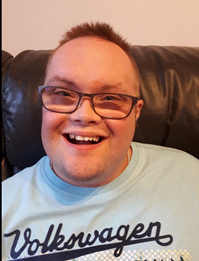 Hello my name is Scott, I am 20years old and have Downs syndrome and numerous complex health needs including Brittle Asthma and Bronchiectasis. I developed asthma at the age of 18 months old after I had chronic pneumonia, I have been hospitalised numerous times due to Asthma aswell as for pneumonia. I suffer with numerous chest infections and bouts of pneumonia year after year, I was eventually diagnosed with Bronchiectasis after being hospitalised with severe swine flu and pneumonia at the age of 16 years old. I continue to get a lot of exasperations of Asthma as well as chest infections despite prophylactic antibiotics and medication. I get very frightened and become panicky when I’m struggling for breath or unable to stop coughing, I need a lot of support and reassurance until my symptoms begin to ease a little. I need daily percussion physio and mucus clearance using a mucus clearance device. I take lots of oral medication, inhaled medication as well as omalazimub injections for my Asthma every 4 weeks. 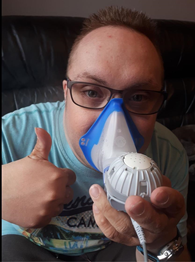 I have all inhaled medication via a nebuliser, I take 3 different preventative nebules 4 time’s a day followed by physio clearance using an acapella device, I also have emergency reliever nebules when needed. Before NARA kindly donated my new Pari Eflow my old nebuliser was taking 39 minutes for all 3 nebules one after the other 4 time’s a day accumulating to 2 plus hour’s daily which I found extremely difficult. With my Pari Eflow it takes a maximum of 8 -10 minutes 4 time’s a day, 40 mins max daily , a massive improvement which I am extremely happy about. This gives me more quality time to do the things I like and get up to more mischief if you ask my parents! I am encouraged to be as physically active as my health allows on a daily basis. I try and start each day after my 1st nebuliser regime with some exercises on a cross trainer, twist and shape and rowing machine. I also swim twice a week and sing very loudly a lot every day to the delight of my family and friends, ha ha! The less active I am the harder it is to clear my lung mucus. 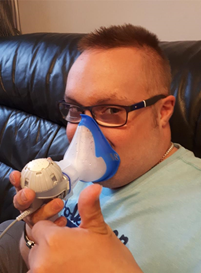 I am so grateful to NARA for helping aid improvement to my life, not only has the Pari Eflow nebuliser reduced treatment times it provides a more effective deliverance of medication due to the inspiratory valve.